If we make a fetch from an arbitrary web-site, that will probably fail. The core concept here is origin – a domain/port/protocol triplet. Cross-origin requests – those sent to another domain (even a subdomain) or protocol or port – require special headers from the remote side. That policy is called “CORS”: Cross-Origin Resource Sharing. Because cross-origin restrictions protect the internet from evil hackers. Seriously. Let’s make a very brief historical digression. A script from one site could not access the content of another site. That simple, yet powerful rule was a foundation of the internet security. E.g. a script from the page hacker.com could not access user’s mailbox at gmail.com. People felt safe. But web developers demanded more power. A variety of tricks were invented to work around it. So, it was possible to make a GET/POST request to another site, even without networking methods. But as it’s forbidden to access the content of an <iframe> from another site, it wasn’t possible to read the response. So, <form> allowed to submit the data anywhere, but the response content was unaccessible. Another trick was to use a <script src="http://another.com/…"> tag. A script could have any src, from any domain. But again – it was impossible to access the raw content of such script. If another.com intended to expose data for this kind of access, then a so-called “JSONP (JSON with padding)” protocol was used. First, in advance, we declare a global function to accept the data, e.g. gotWeather. Then we make a <script> and pass its name as the callback query parameter, e.g. src="http://another.com/weather.json?callback=gotWeather". The remote server dynamically generates a response that wraps the data into gotWeather(...) call. As the script executes, gotWeather runs, and, as it’s our function, we have the data. That works, and doesn’t violate security, because both sides agreed to pass the data this way. And, when both sides agree, it’s definitely not a hack. There are still services that provide such access, as it works even for very old browsers. After a while, modern network methods appeared. At first, cross-origin requests were forbidden. But as a result of long discussions, cross-domain requests were allowed, in a way that does not add any capabilities unless explicitly allowed by the server. Any other request is considered “non-simple”. For instance, a request with PUT method or with an API-Key HTTP-header does not fit the limitations. The essential difference is that a “simple request” can be made with a <form> or a <script>, without any special methods. So, even a very old server should be ready to accept a simple request. 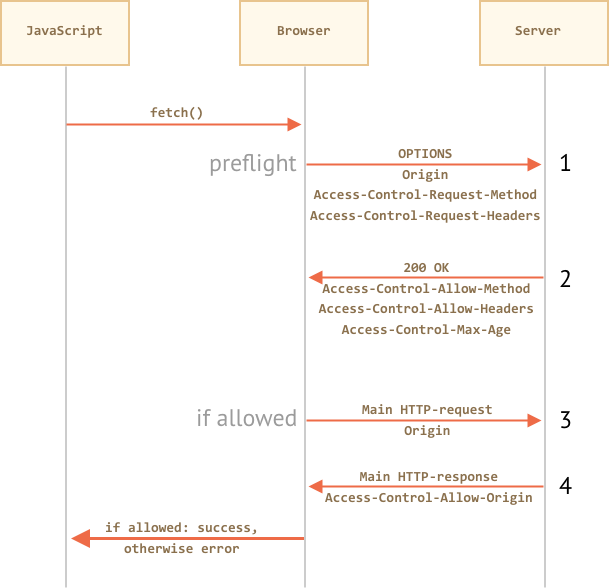 When we try to make a non-simple request, the browser sends a special “preflight” request that asks the server – does it agree to accept such cross-origin requests, or not? And, unless the server explicitly confirms that with headers, a non-simple request is not sent. Now we’ll go into details. All of them serve a single purpose – to ensure that new cross-origin capabilities are only accessible with an explicit permission from the server. If a request is cross-origin, the browser always adds Origin header to it. As you can see, Origin contains exactly the origin (domain/protocol/port), without a path. It ensures that the corrent Origin is sent with a cross-domain request. Any other response header is forbidden. Please note: there’s no Content-Length header in the list! So, if we’re downloading something and would like to track the percentage of progress, then an additional permission is required to access that header (see below). With such Access-Control-Expose-Headers header, the script is allowed to access Content-Length and API-Key headers of the response. We can use any HTTP-method: not just GET/POST, but also PATCH, DELETE and others. Some time ago no one could even assume that a webpage is able to do such requests. So there may exist webservices that treat a non-standard method as a signal: “That’s not a browser”. They can take it into account when checking access rights. So, to avoid misunderstandings, any “non-simple” request – that couldn’t be done in the old times, the browser does not make such requests right away. Before it sends a preliminary, so-called “preflight” request, asking for permission. A preflight request uses method OPTIONS and has no body. Access-Control-Request-Method header has the requested method. Access-Control-Request-Headers header provides a comma-separated list of non-simple HTTP-headers. If the server agrees to serve the requests, then it should respond with status 200, without body. The response header Access-Control-Allow-Method must have the allowed method. The response header Access-Control-Allow-Headers must have a list of allowed headers. Additionally, the header Access-Control-Max-Age may specify a number of seconds to cache the permissions. So the browser won’t have to send a preflight for subsequent requests that satisfy given permissions. The path – exactly the same as the main request: /service.json. Origin – the source origin. Access-Control-Request-Headers – a comma-separated list of “non-simple” headers. That would allow future communication, otherwise an error is triggered. Now the browser can see that PATCH is in the list of allowed methods, and both headers are in the list too, so it sends out the main request. Besides, the preflight response is cached for time, specified by Access-Control-Max-Age header (86400 seconds, one day), so subsequent requests will not cause a preflight. Assuming that they fit the allowances, they will be sent directly. When the preflight is successful, the browser now makes the real request. Here the flow is the same as for simple requests. A cross-origin request by default does not bring any credentials (cookies or HTTP authentication). For example, fetch('http://another.com') does not send any cookies, even those that belong to another.com domain. Does the server really trust pages from Origin that much? A request with credentials needs an additional header to pass through. Now fetch sends cookies originating from another.com with the request. If the server wishes to accept the request with credentials, it should add a header Access-Control-Allow-Credentials: true to the response, in addition to Access-Control-Allow-Origin. Please note: Access-Control-Allow-Origin is prohibited from using a star * for requests with credentials. There must be exactly the origin there, like above. That’s an additional safety measure, to ensure that the server really knows who it trusts. Networking methods split cross-origin requests into two kinds: “simple” and all the others. Method: GET, POST or HEAD. The essential difference is that simple requests were doable since ancient times using <form> or <script> tags, while non-simple were impossible for browsers for a long time. So, practical difference is that simple requests are sent right away, with Origin header, but for other ones the browser makes a preliminary “preflight” request, asking for permission. → The browser sends Origin header with the origin. …Then the server should list the allowed ones in Access-Control-Expose-Headers header. Access-Control-Max-Age with a number of seconds to cache permissions. Then the actual request is sent, the previous “simple” scheme is applied. Why do we need Origin? As you probably know, there’s HTTP-header Referer, that usually contains an url of the page which initiated a network request. As you can see, both Referer and Origin are present. Why Origin is needed, if Referer has even more information? If it possible that there’s no Referer or Origin, or it’s incorrect? We need Origin, because sometimes Referer is absent. For instance, when we fetch HTTP-page from HTTPS (access less secure from more secure), then there’s no Referer. The Content Security Policy may forbid sending a Referer. As we’ll see, fetch also has options that prevent sending the Referer and even allow to change it (within the same site). 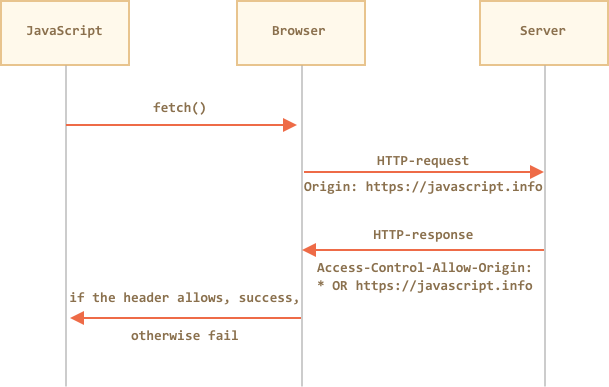 By specification, Referer is an optional HTTP-header. Exactly because Referer is unreliable, Origin was invented. The browser guarantees correct Origin for cross-origin requests.